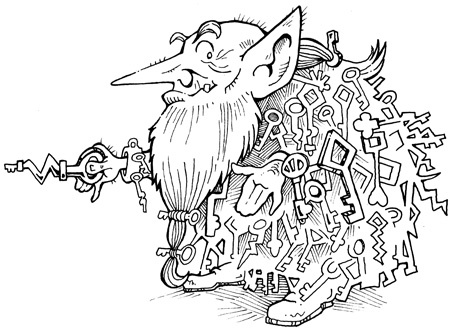 Of all the dwarves in the underground kingdom of Umbor, perhaps none was so strange as Crumpit, the master of keys. He was clothed in a robe made entirely of keys, all of which were used for unlocking the hundreds of doors that led into Umbor. Crumpit spent a lifetime memorizing the exact route to Umbor. He knew exactly which key matched which door. Sometimes the doors were plain to see, and sometimes they were hidden. Some were in the floor, some were in the ceiling, and some weare so tiny that the dwarf has to crawl through on all fours. Sometimes there were fake doors from which to choose, and the right choice was vital—for one wrong turn on the secret path to Umbor could lead to a pool of bubbling lava, a nasty fall, or even a nastier skerpent. Kendra Kandlestar and her friends met Crumpit while searching for the Door to Unger. The strange dwarf led them into the kingdom of Umbor, so that they might have an audience with King Reginaldo and gain advice about their quest. Little did they know that Crumpit had an alterior, more sinister, motive for escorting them to Umbor.